For the past few weeks, fake presidential candidate Donald Trump has been spreading Birther nonsense on a media tour that is clearly designed to increase the ratings on his "Celebrity Apprentice" show and to garner free press. James Poniewozik points out that NBC, the network on which "Celebrity Apprentice" airs, hosted Trump for an extended and generally friendly interview on the Today Show this morning. There's also a new NBC/WSJ poll that shows Trump behind only Mitt Romney in the GOP field. For reasons Steve Kornacki has explained, that shouldn't be taken too seriously. The takeaway for the Today audience: Maybe Obama was born in America! Maybe not! We'll check back and see what exciting news Donald has dug up in a few weeks, as we get closer to the exciting finale of Celebrity Apprentice! Oooh, that Donald! Sad to say, he's right. 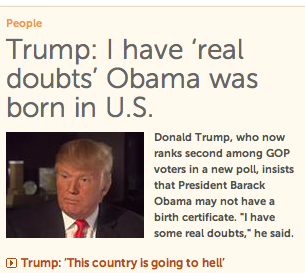 Trump -- and NBC -- are having remarkable success in the further mainstreaming of Birtherism.